In the year since Imperial Bank, a mid-sized Kenyan bank, collapsed, investigators have found multiple threads. The main one revolves around a thriving parallel banking system that didn’t end until weeks after its main player died. Abdulmalek Janmohammed: Managing Director (1996-2015). James Kaburu: Chief Financial Officer. Naeem Shah: Head of Credit. Alnashir Popat: Chairman, Board of Directors. W.E.Tilley (Muthaiga)’s bank account records. The transactions didn’t make sense. From the records, 3.058 billion shillings had moved quickly from one account to several accounts in the span of an hour. But that’s not what didn’t make sense; they had been authorized by a dead man. In fact, he had been dead for two days. Even more bizarre, the account holder from whose account the money had originated had also died. All of 14 years earlier. The man was Abdulmalek Janmohammed, the pot-bellied Imperial Bank Managing Director who succumbed to three successive heart attacks in a single day in mid-September 2015. The account holder was Hanscomb Management Limited, which, from government records, was dissolved in January 2002. Set up in February 1996, the company had never been anything more than a briefcase company. It was wound up after the registrar filed to dissolve tens of such companies founded in the dying years of the Moi administration. At Imperial Bank though, Hanscomb’s bank account remained alive and active. In the 14 years until after Janmohammed’s death, 76 billion shillings moved through the account. 3 of those billions are what was emptied by a dead Abdulmalek, or rather, by one of his senior bankers under the guise of transactions approved by a dead MD. The principal amount was sent to various accounts, and the interest to three accounts. The first of these, one of only two held by the fish company W.E. Tilley directors as individuals, received Shs. 1.1 billion. The second, under the name Barkhat Khan, received Shs. 162 million, and the third, under Gulshan Janmohammed’s, Abdulmalek’s mother, name received Shs. 363 million. Imperial Bank was closed about a week after Hanscomb’s busy morning. As investigators dug into the bank, they found that it wasn’t just Hanscomb that had been busy that day. Several other accounts stood out because they had no name and no existing company behind them. But they had been remarkably busy in the last decade, and on a single day after the bank’s MD fell during a meeting at Capital Club and died a few hours later. But it was just about to get weirder. In its last audited accounts, filed months before Abdulmalek died, Imperial Bank had declared 52 billion shillings in customer deposits. But this didn’t tally as soon as auditors dug just beneath the surface. Buried deep within the books was 33 billion shillings more; the bank had almost 86 billion shillings, not the 52 billion it had declared. But from the look of it, the bank’s 50, 000 plus depositors had only had 52 billion in the bank. So whose money was it? In 2012, someone sent three whistleblower emails about Imperial Bank to multiple people and agencies. The first, in March, was sent by “The Patriot”; he or she had clear insider knowledge of the bank. When nothing happened, another followed in April, and a third that September. They talked about bad loans, money laundering, parallel banking and a litany of banking and fraud activities. One of them named a man called Asif Taibjee, then Imperial Bank’s Assistant Head of Credit, as the man responsible for running a network of temporary bank accounts. The accounts would be set up for specific transactions, and most would be wound up immediately after they served their purpose. Asif left Imperial Bank the next year for Chase Bank, and then he died in a gory motorbike crash in 2014. The death was ruled an accident. The three whistleblower emails should have been enough, at least in some aspects, to raise more than just eyebrows about Imperial Bank. But the cozy relationship between Abdulmalek Janmohammed and Central Bank mandarins made it impossible for anyone to do much. Abdulmalek, unlike other bank executives like Ketan Somaia and Ajay Shah, had learnt how to maintain an intricate balance that protected him, his friends, and his business partners. His delicate accounting, which should have made investigations into his dealings over the years easier, only revealed the many layers of the Imperial Bank story. He kept such details as his credit card payments for the CBK Governor’s wife’s trip to Thailand most likely as leverage. The whistleblower talked about money laundering, and vaguely described the side of a parallel bank he or she could see. There were unsecured loans, definitely, but the bank didn’t seem to be bleeding. Although each email escalated the last, nothing happened except emails from managers at Central Bank to Imperial Banks CFO James Kaburu to enquire the veracity of the claims. But something deeper had always been happening at the bank. One of the things that didn’t make sense in the initial digs into the Sack of Imperial Bank was where all the money was going. There were three major conduits, as we saw in Part 2. The first was through a fish processing company with a history, the second through two companies owned by friends, and the third through a personal investment fund. These three were clear when American forensics firm FTI Consulting turned some parts of the bank over in September 2015. The firm produced the first comprehensive report of Imperial Bank and designed a recovery plan to fill in what, at first, looked like just a hole in deposits. The assumption was that the money was from the depositors, but it had been pilfered over the years. But it was much more complicated than that. On October 19th 2015, the firm was hired by Imperial Bank’s new handlers, Kenya Deposit Insurance Company (KDIC) to dig through the bank and its many threads. A month later, on 27th November 2015, Project Stork begun. Project Stork was the codename of the assignment given to FTI to dig into the most prominent name in the sack of Imperial Bank, the muddied fish company called W.E Tilley (Muthaiga). It’s easy to see the allure of the name, storks are wading birds that eat fish, and FTI’s investigators were being sent out to dig through a fish monger. Deploying some of its best and brightest, led by a forensic accountant called Andrew Durant, the forensics firm dug through public records, conducted interviews and ransacked the bank’s records looking for the fish firm. 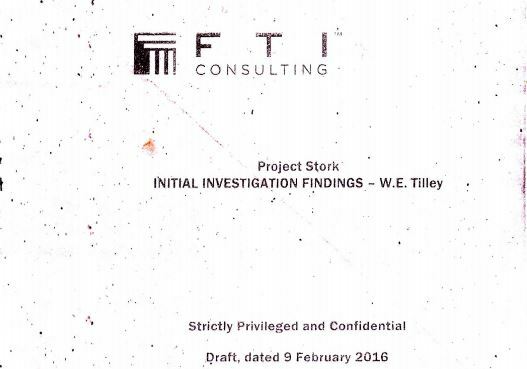 The first draft report, titled “Project Stork: INITIAL INVESTIGATION FINDINGS” was submitted on 9th February 2016. It was marked “strictly privileged and confidential”, and it remained so until it was leaked online in July 2016. To dissect W.E. Tilley without the help of its owners, FTI dug into the company’s history, both legal and financial. They found that W.E. Tilley is a fish processing firm that is a parent entity to 12 subsidiaries. Most of these companies had accounts at Imperial Bank. The parent company itself had 46 accounts in total, and its subsidiaries had between 2 and 6 each. In total, 13 companies had 73 accounts in a single bank. The busiest accounts of the parent firm, one USD and one KES, were account numbers 0100805162 and 0100805006. Through these two alone, Shs. 2.324 billion moved in 2006, and Shs. 16.553 billion between 2013 and 2016. Another account received 14.406 billion, bringing the total to that account alone to 33.285 billion. The total, with two other accounts, was Shs. 34.487 billion. Most of these were overdrafts, with outflows always exceeding the available amounts. To clear the imbalance, the interest account would be converted into a loan, totalling, over the years Kshs. 18 billion that was never meant to be repaid. FTI couldn’t find any loan documentation to support the conversions. In fact, the last time the fish company had obtained a proper loan, according to available evidence, was in May 2000, after applying for a Shs. 6 million loan nearly a year earlier. Between 2000 and 2001, W.E Tilley applied for overdraft facilities of 95m in total, but within a few years, would be withdrawing this every week. Most gross outflows from these accounts was higher than the amounts available, and there were numerous transactions with accounts that were closed after single transactions. Even more, some large depositors had noticed sudden large deposits into their account which would then be transferred after a while, sometimes within minutes. Like Hanscomb and a few other accounts of dead companies, W.E. Tilley’s accounts were incredibly busy between 2001 and 2015. Unlike the dead companies though, W.E. Tilley had had a legitimate business, fish processing, founded on March 21st, 1969. After its don, Aziz Haideralli Jessa died in 2005, the company moved to his brother and his wife. But little changed about the business model. In 2004, there were 14 fish processing and export companies around Lake Victoria alone. W.E Tilley was one of the busiest, focusing on Nile Perch fish. By 2009, there were only 6 factories around the lake, as the fish catches were dwindling fast. W.E Tilley was one of the survivors, scaling down on its 60 metric tonnes installed capacity by utilizing only 24 tonnes per day. But throughout those years, W.E Tilley’s accounts showed little effect of the market distress. From its company financial filings, the company made losses of Shs. 11 million and Shs. 22 million in 2011 and 2012 respectively, against revenues of Shs. 2.9 billion and Shs. 2.4 billion. According to its auditors, none of the massive injections of an average Shs. 80 million a week from Imperial Bank were declared in its financial books. So what was it doing with the money? In 2006, a smaller bank called Charterhouse was closed after it was suspected of everything from money laundering to tax evasion. Inside the bank were several key accounts despite the lack of historical records because of a suspicious fire two years earlier. W.E. Tilley featured because it had moved four times the amount of money it had made in its fish processing and export business. Around 2004, the fish company had six accounts distributed evenly among Fidelity, Imperial Bank, and Charterhouse banks. In each bank, the company had a shilling and a dollar account. It would move money between the different currency accounts, and also deal heavily in foreign currency trading. Around the same time, something else disappeared at Imperial Bank. At Imperial Bank, W.E. Tilley and Abdulmalek communicated through a rudimentary system. W.E. Tilley preceded each request for money with a comprehensive tally of the money they would need to move during that week. Abdulmalek would then write chits to his Head of Credit, Naeem Shah. This system worked from 2001 to 2006, then the first part seemingly stopped after Imperial Bank bought and installed the banking software, FlexCube. Now the only thing linking Abdulmalek to the extensive line of credit to a single fish processing company, were handwritten chits, and occasionally, a curious cheque. At 5:26pm on September 9th, 2009, the Senior Business Development Manager at Imperial Bank, Mehbooba Shamji, wrote to another employee, Farheen Rajan. He asked her to move 22 million shillings from an account under the name Sadrudin Jiwa to W.E. Tilley’s account. She was then to withdraw the balance of 39 million and put it in a single sealed envelope for Sadrudin to collect. 6 years later, on January 7th 2015, Mehbooba emailed the Head of Credit, Naeem Shah, about the same account. “Small favor please. Mr. Jiwa may need to pay KES 20M to Econobuild Ltd from his account Al-Fatim. He will give instructions for KES 20M to be transferred from his ‘special’ deposits” What “special” deposits were these, and what did the quotation marks mean? For Kenya’s financial historians, the name Sadrudin Jiwa is one of the minor ones from the wild 1990s. Sadrudin received 9.35 million shillings from Goldenberg, a rather small amount in the much larger public funds scandal. Little is known about the man, but the transactions between him and W.E Tilley, and the mention of “special deposits” pointed to something else. In the Project Stork report, the investigators noted that there was a relationship between Jiwa and the fish company, but that they didn’t know exactly what it was. What they did find were curious transactions between Jiwa’s USD accounts at Imperial Bank with a Swiss account also under his name. FTI suspected it was “window-dressing, and could possibly be indicative of money laundering.” Jiwa’s name came up among 23 entities that had moved money into W.E. Tilley accounts. The money originated from 13 countries: Cyprus, Germany, Hong Kong, Israel, Kenya, Moldova, Romania, Switzerland, The Netherlands, UAE, and Uganda. 9 of the companies were in the fish business, two in meat products and a single one in agriculture. The other 11 were cryptic, some existing only as bank accounts and names in registrar records. What all these threads mean, from the hidden balance sheet amount to the circular transactions, is that beneath Imperial Bank’s purple surface lay a parallel bank, and W.E. Tilley was its main branch. Ostensibly, its work was to loan out money to specific people and pay it back through different accounts, after taking a commission. Such a trail meant the money couldn’t appear in transactions in their owner’s name, and they instead used a tried and tested service that didn’t cost much, and had never been broken. On the surface the fishmonger remained in legitimate business, but made its core income from transactions that, to the untrained eye, seemed harmless. But the system was open to almost anyone who had money, or needed money, away from watchful eyes. In September 2015, a week after Abdulmalek Janmohammed died, W.E. Tilley wrote a 10 billion shillings IOU to Imperial Bank. It simply admitted to having taken all the money for itself, and offered several properties as securities. In June 2016, just days before FTI submitted its final Project Stork report; W.E. Tilley defended itself in court saying it was tricked into writing the IOU letter. The surviving Imperial Bank’s directors, W.E. Tilley wrote, had asked for a letter of comfort to pacify CBK during its investigations into Imperial Bank. In 2003, Charterhouse Bank hired a new internal auditor, Peter Odhiambo, from Barclays Bank. Odhiambo took only a few months to discover that things were not right with the bank. So he assembled a dossier and submitted it to the Kenya Revenue Authority. He eventually had to seek asylum after receiving death threats but his dossier triggered an investigation. Investigators found that the bank was involved in everything from money laundering to insider lending to tax evasion. A key in the pipeline had been turned, and it was just a glimpse into how a network of banks and bankers had perfected a system. The last decade of the Moi administration was a time of exceptional plunder. Everyone, including the Big man himself, was on a ransacking spree, and his minions followed his example. But even Moi had learnt something about global finance and knew he couldn’t simply pile the money in accounts. From the very start, he kept most of his property under many other names, avoiding family and most of his lieutenants. So everyone around him learnt the value of hiding property and money properly. Chopdi, an informal parallel banking system that had grown in East Africa after Idi Amin’s purge, suddenly became all the rage. But global finance was still lax on money laundering and financial impropriety rules. That changed in just five minutes in 1998. In the five minutes between 10:30 am and about 10:35 am on August 7th, 1998, two bombs went off infront of the American embassies in Kenya and Tanzania. It was the most serious terror attack in Nairobi since 1981, and a first of its kind in Tanzania. For the Americans, it was a clear sign that terror had a new face, and new muscle. Investigators flooded East Africa, retracing the steps of the attackers and piecing together why it had been so simple to attack the embassies. To plan the attacks, the terrorists had bought a villa in Runda, Nairobi, and a second, House 213, in Illala, Dar es Salaam. Using the region’s lax financial security protocols, if any, they had moved millions to buy the houses, the trucks, and bomb making material. In later years, caches of data found would point to an attack planned with military precision, including in funding, supplies, and paying human resources. In the months after that bloody morning in August, the US added Kenya to its Antiterrorism Assistance Program. Although this meant a closer security relationship, it also meant more scrutiny on all things even remotely related to terrorism and money. In December 1999, the UN passed the Terrorist Financing Convention which required all signatories to criminalize financing acts of terrorism. Although dirty money had been channeled through tax havens for decades, such conduits became increasingly important between 1997 and 2002. The plunder continued but everyone adapted to the new post-August-1998 reality. At the turn of the millenium, Kenya’s Central Bank issued a new set of rules. Banks now had to verify customer identity, and any transactions above $100, 000 had to go through the apex bank for assessment. This meant that any suspicious transactions would be flagged in the system. Huge transactions, such as one of $25 million in Kenya to an account in Charterhouse in 2001, would be flagged by everyone from the FBI to Kenya’s Central Bank. Bankers became even more important as they could be trusted, for a fee, to make the trails disappear as fast as they appeared. For them, providing transaction anonymity to the same people who were supposed to be policing banks was just too easy. So most of them offered such under-the-book banking services. Billions disappeared through these routes to accounts across the world, some under the names of bagmen, and others simply as bank account numbers with no name. When the new administration came to power in 2003, one of its first acts was to hire Kroll and Associates, a forensics firm, to track down where all the money had gone. Kroll’s 106-page report was never officially released; it was leaked in 2007. It told several stories. Moi and his men had perfected a smoke and mirrors model to move money. Moi himself preferred using bagmen like Joshua Kulei, his private secretary. In Kenya’s parallel banking system, Kulei was known as “God’s Banker.” If he needed something done, no one asked questions because he wasn’t doing it for himself. Men like Kulei, in turn, preferred Asian frontmen to add on to the layers. In the Kroll Report, Pankaj Somaia, one of the two men who appeared at the head of the second major thread in the sack of Imperial Bank, was called “Joshua Kulei’s bagman.” Joshua Kulei was one of Moi’s main bagmen, making Pankaj the bagman to a bagman. 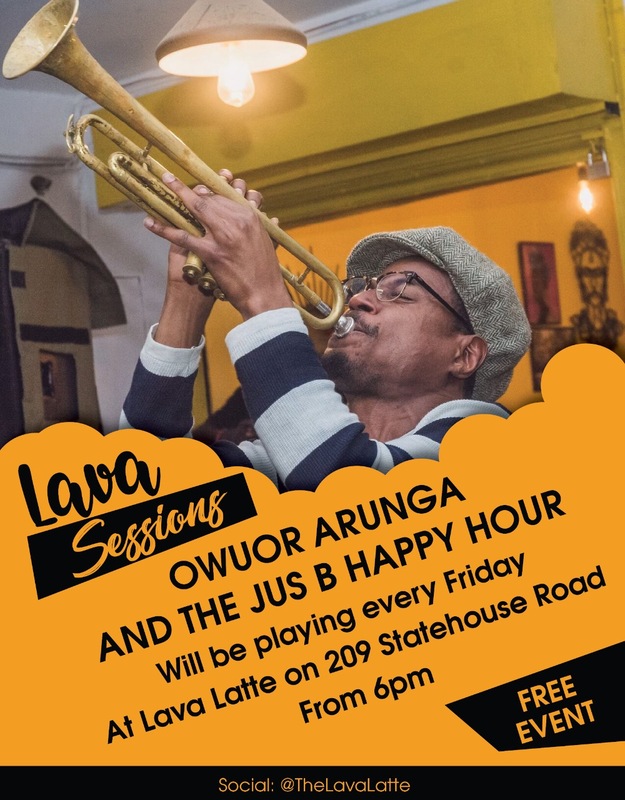 Ketan Somaia, Pankaj’s cousin and then head of Equatorial Bank, was “Oyugi’s bagman.” Ezekiel Oyugi was the PS in the office of the President, and one of the president’s network of frontmen. But the amounts were massive and no single banker could handle them all. From the 1980s, politicians had been acquiring small banks, especially those in financial distress. On the surface, these banks had little market share, but they had thousands of bank accounts. One of them was Transnational Bank, thought to be owned by the Mois, which was one of the local banks used by a global money mover called Gabriel Katri. Most of the other banks named in the report: City Finance Bank, Eurobank, Giro Bank, Trust Bank, Citibank, ABN-AMRO, First American Bank, and SAMUT-Trust were owned, at least on paper, by Asian men. 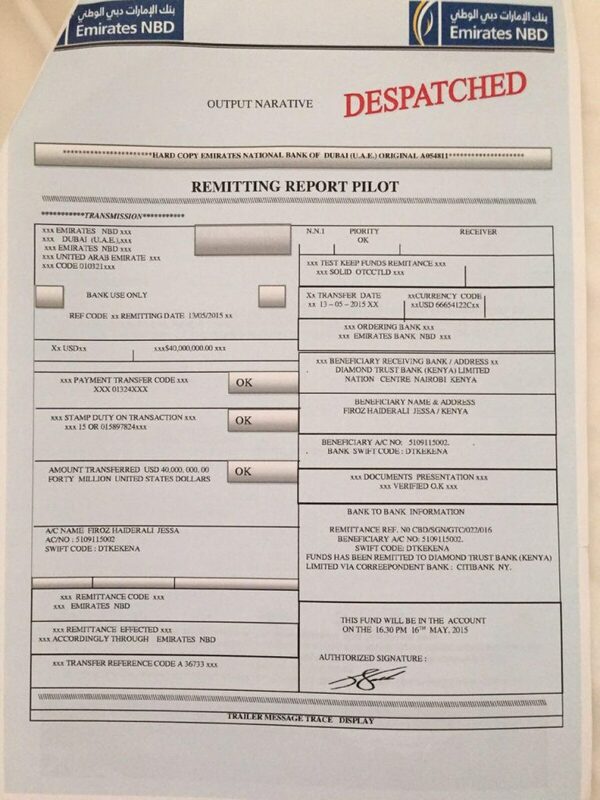 Ketan Somaia, now in a London jail and still wanted in at least three countries, owned Delphis Bank. In those days, most of the money flowing through these banks was from corruption. Money from government tenders, kickbacks, aid money, and unexplained bonuses was channeled out of Kenya. But the tunnel of multiple layers of accounts and fake transactions for legitimate and briefcase companies soon found other customers. These included drug dealers, arms dealers, foreign intelligence agencies, the Italian Mafia and even businessmen seeking to hide wealth from their business associates and wives. In 2001, when the world was closing on the financial sector, the sack of Imperial Bank begun. Beneath it, a second, larger river ran, driven by hundreds of fictitious bank accounts, and money from unknown sources. It would remain undiscovered for a decade and a half. The lanky bespectacled man walked to the leather seat and sat pensively. Dressed in a blue striped suit and a white shirt, he eyed the line of men and women seated across him. It was a Tuesday afternoon, in late July 2016. Just one year into his tumultuous job as the 9th Governor of Central Bank, Patrick Njoroge had moved from one acid test to the next, closing up three banks just eight months into the job. It had been a proper baptism of fire, and here, before the men and women of the Finance, Planning and Trade parliamentary committee he could finally be candid. As they shuffled their papers begun the session, he toyed with a pen in his left hand. The hearing was typical window-dressing, for the most part, but then Njoroge turned the tide. When asked why he had not solved Imperial Bank, he replied that he had found out that his institution was more involved in the mess than he had ever imagined. It was his first ever public admission of defeat. What the Central Bank boss had discovered was that the real person he was fighting had died in September 2015. Even to his colleagues and business partners, Abdulmalek Janmohammed was not a normal banker. He hadn’t been in more than a decade. One of the few friends he had recently recounted how one time, in a moment of vanity, Abdulmalek showed an unused set of number plates he carried in the boot of his silver Mitsubishi Lancer. They were car plates reserved for Government of Kenya officials-GK plates. To the parliamentary committee, the CBK Governor threw another spanner into the gears, this time, a shocking and still unexplained one. Abdulmalek Janmohammed had eight valid passports in his name when he died. Seven of them were ordinary passports in the banker’s name, with slight alterations to his lengthy names: Abdulmalek became “Abdulmalik” or “Abdulmaleek” or something close. The eighth one was a diplomatic passport, a red passport only meant to be issued to top government officials. How he had acquired government plates, all those passports remains a mystery to this day. Even in a country famous for the power of money, acquiring 8 different passports looks impossible. But that was Abdulmalek’s absolute genius. He had a system people needed, and he could make or move money for them. In return, he wanted power and access. The protectors of the system became indebted to a man who didn’t intend to get caught. One of the possible, but lesser reasons that explains Abdulmaleks close quid-pro-quo relationship with the system was that he would easily make available vast amounts of dirty money used to short the forex market. With access to billions, it was possible for CBK staff to mop up significant amounts of foreign currency, particularly the USD. With supply cut off, the demand would rise and the players would smartly play the forex market, making clean margins from the dirty and borrowed monies. The owners of the laundered money would still have their money intact. In the end, the genius was that to properly dissect Imperial Bank would be to dissect not just the banking sector, but Central Bank itself, and several prominent personalities and businesses. Even digging the W.E Tilley thread would, and could, result in a butterfly effect that could rope in everyone from local businessmen to the Italian Mafia. What had at first looked like a fistfight, soon became clear it was a beating. What the Central Bank boss left out was how expensive an endeavor this discovery had been. In March 2016, after receiving the Project Stork report, Njoroge announced a new investigation. He said that there were “700 accounts and 22, 250 transactions to dig through. The information was scattered across 1.2 terabytes of electronic data; so massive that if it was printed, it would stack papers about 7, 200 kilometers in total.” Everyone would have to wait. What was missing in the announcement was that FTI would be earning 338,000 per week (44 million shillings) to dig through the fishmonger and the threads, all paid from Imperial Bank’s coffers. According to Business Daily, the estimated fees were broken down as “155,000 (Sh22.7 million) for on-site investigation, 45,000 (Sh6.5 million) in other expenses, a retainer of 100,000 (Sh14.6 million.” This totaled Shs. 1.4 billion in the first seven months, paid from Imperial Bank’s deposits. None of these expensive reports were ever officially released to the public or the bank’s depositors. Snippets of it have been used in courts, and one report leaked online. 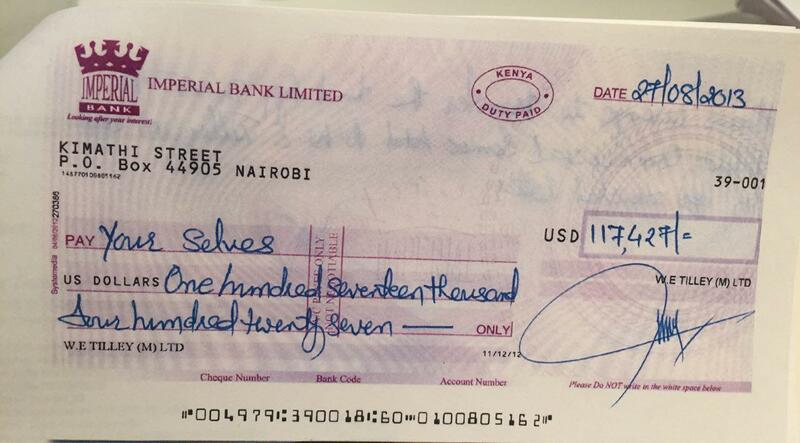 Imperial Bank was also paying its receiver manager, KDIC, and all the employees it still had. In that time, a group of depositors under the name IBL Depositors united to pile pressure on Imperial Bank’s surviving shareholders. 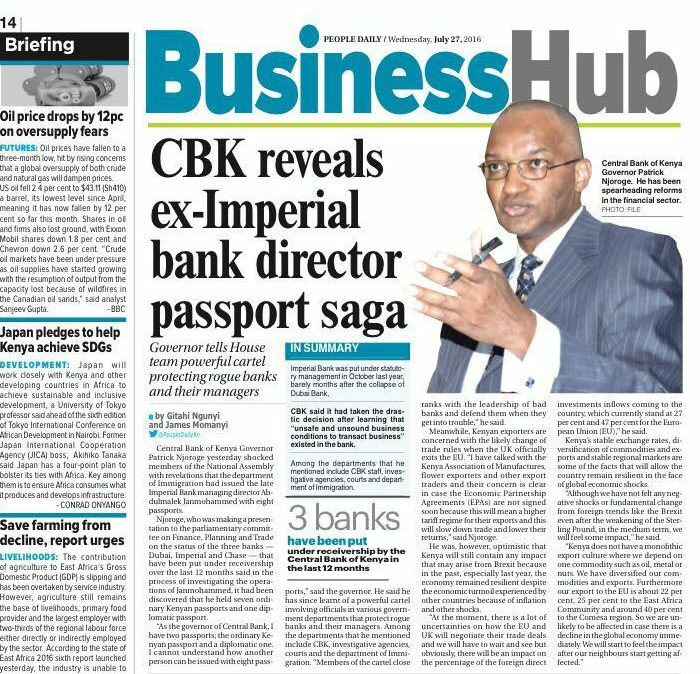 In the story, the CBK boss was under siege from the court cases filed by the bank and its shareholders against receivership. In the background, the stories and their threads got muddied, sometimes by clear omission. The organized group held one protest outside Imperial Court demanding that the other shareholders return the bank’s money. A good example of omissions, according to a senior source at Central Bank who requested anonymity, is that three different institutions have tried to take over IBL in the last year. The same thing happened in the week before the third bank, Chase Bank, was closed in April 2016. All the proposals for Imperial Bank were turned down before NIC bank was announced as the assets and liabilities consultant. Finally, another portion of the bank’s original 50, 000 plus customers would be paid off through a different mid-tier lender. There was little mention of due diligence, and no one knows, to this day, exactly how much money Imperial Bank has, or even had in hand, a year ago. Its excess amounts remain a quiet footnote in most stories, its owners afraid to claim it. In the courts, the fight for Imperial Bank rages on. On one side, Imperial Bank shareholders have filed suits and judicial reviews seeking to keep the bank afloat. On the other, Central Bank and KDIC have defended their actions, started prosecutions against several people and sued Imperial Bank’s remaining shareholders. But under these simmering war is a system where the true sack of Imperial Bank is happening; to bury the bank and everything in it. Featured image was obtained from The Star. It shows two W.E. Tilley Directors and two Imperial Bank executives (James Kaburu and Naeem Shah) in court. The screengrab of the CBK Governor story was obtained from a PDF version of People Daily newspaper of Wednesday July 27th, 2016. Most of this story was built from a combination of interviews and records. Bank account records and email conversations constituted most primary sources, although interviews were critical in filling in the gaps. Most documents I used here were part of court filings filed by CBK, Imperial bank’s shareholders, and a depositor. The Project Stork report was critical for the epilogue because it dug into parts of the bank not accessible to the sources I had. This series was edited by one main editor and a copy editor, who both chose to remain anonymous, but all mistakes here remain mine (also, if you spot one, leave a comment so I can fix it).